Sours are delicious, and we make them pretty frequently. Creamy, well-integrated, and friendly to a wide variety of spirit, what’s not to like? That said, what to do when you happen to be out of eggs, or you are serving folks who won’t or can’t eat egg whites? Is there a viable alternative? After doing some reading online, we found that both gum arabic and gelatin among others were put forward as possible substitutes for egg white. We settled on experimenting with them as they are both fairly easily obtainable (gelatin more so) and weren’t called out as having any obvious detractions, like bitter aftertaste or what have you. Neither were identified as ideal substitutes and most sources we found called for foaming them with a cream whipper, but we thought we’d see if either could make at least an adequate sour. 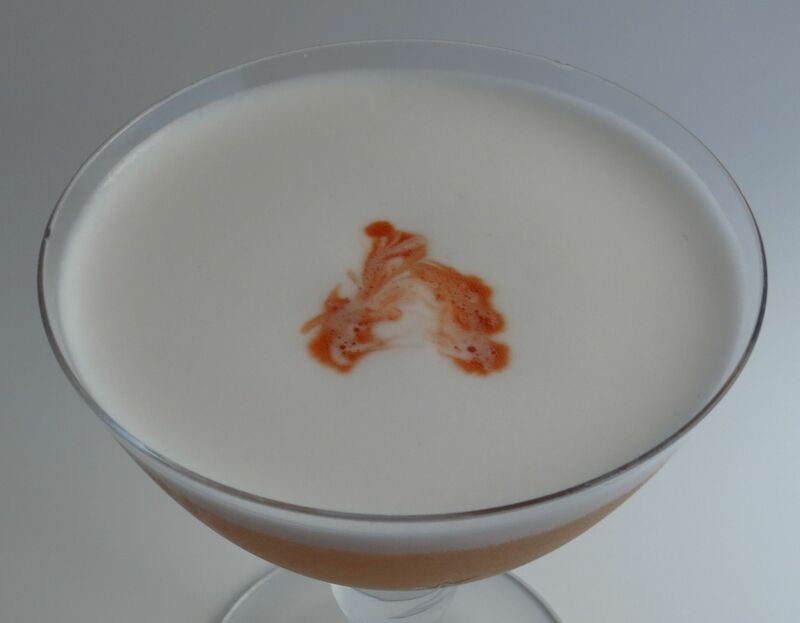 We started by making a classic sour recipe with egg white to serve as a baseline. Mmmm look at that lovely foam. Dry shake a bunch. Add ice. Shake again. Double strain into a glass. Garnish with a few drops of bitters. Enjoy! (*) We modified this recipe slightly with added grenadine and simple syrup. We find the original recipe to be way too tart. We also find that the added sugar helps give the foam a silkier mouth feel. 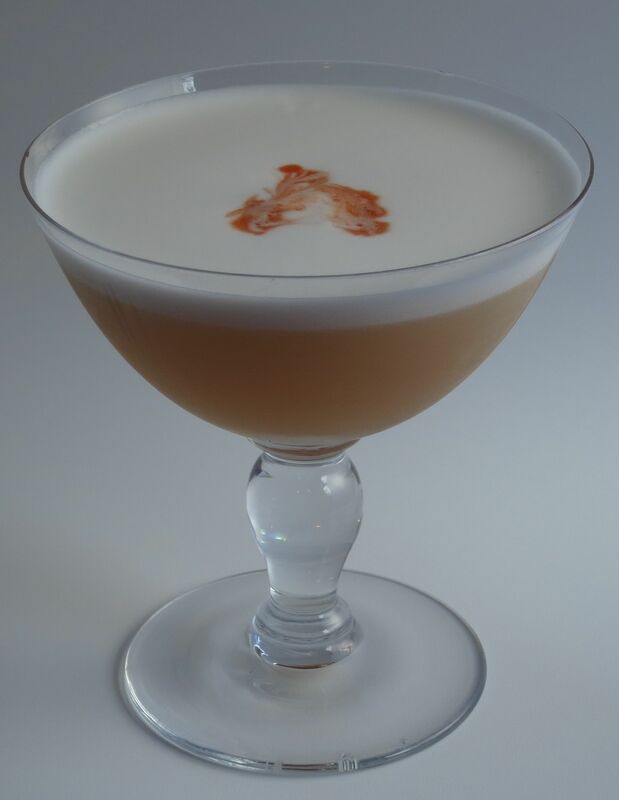 Nose: Angostura, egg white, grenadine, gin, lemon. Palate: Applejack and grenadine to start. Savory spice like toasted cumin, plus juniper from the gin on the mid-palate. Lemon underpinning the mid-palate leads into a tart finish that dries out from the egg white. Creamy, round mouth feel throughout. Next up we tried gum arabic, using the same recipe minus the egg white but with about the equivalent amount (~3/4 oz) of 1:1 gum arabic solution. We gave it a good shake to see what it would do. It had a nice effervescent froth and a heavy mouth feel but definitely not a foam. Not really what we were looking for. Then we tried doing a combination of 1/2 cocktail mixture-1/2 gum arabic in a cream whipper to see if that would make a foam that could just be added on top of the drink. It did make a fizzy “foam”, which lasted for about 10 seconds; transient to say the least. 😉 So gum arabic solution is not a good substitute for egg white if you want a foam. However if you are just looking for the added mouth feel that egg white brings and don’t care about the foam, adding a couple teaspoons of gum arabic solution should do the trick nicely. For purely aesthetic reasons the egg white wins hands down. We took the same approach here as we did with the gum arabic, making one recipe of the cocktail minus the egg white and substituting an equivalent amount of semi-set unflavored gelatin in its place. After shaking, it had a little foam, more than the gum arabic but not as much as we’d want to see, and that amount of the gelatin made it taste a little odd. So we mixed another eggless recipe of the cocktail, this time adding one teaspoon of the gelatin. That tasted OK and had a good mouthfeel. We took the remainder of the first attempt, mixed in more gelatin to make a 1:1 cocktail/gelatin ratio, and put it into cream whipper. After charging and whipping, this approach did yield a decent foam. Still not to egg white levels, but not bad. Nose: Similar nose as the egg white version, minus the egg white odor. Also slightly fainter nose. Palate: Lemon is much stronger. Mouth feel is just OK, the body is heavy but there’s a raw edge that the egg white version lacks. The gelatin doesn’t tie the other ingredients together in the same way. Foam starts to fade and break down pretty quickly. Not a bad drink but not great either, lacks the integration and creaminess of the original. Our thought after the gelatin experiment is that we might try this again after chilling the cocktail-gelatin mixture in the fridge until it is mostly set up, then whipping it, as additional chilling should make the gelatin more stable. That might help make the foam a little more robust. Not sure it would help with the other issues with the drink though. So there you have it. Stick to egg whites, there really is no substitute. Ideas for other substitutes or approaches? Let us know in the comments. Until next time, cheers! 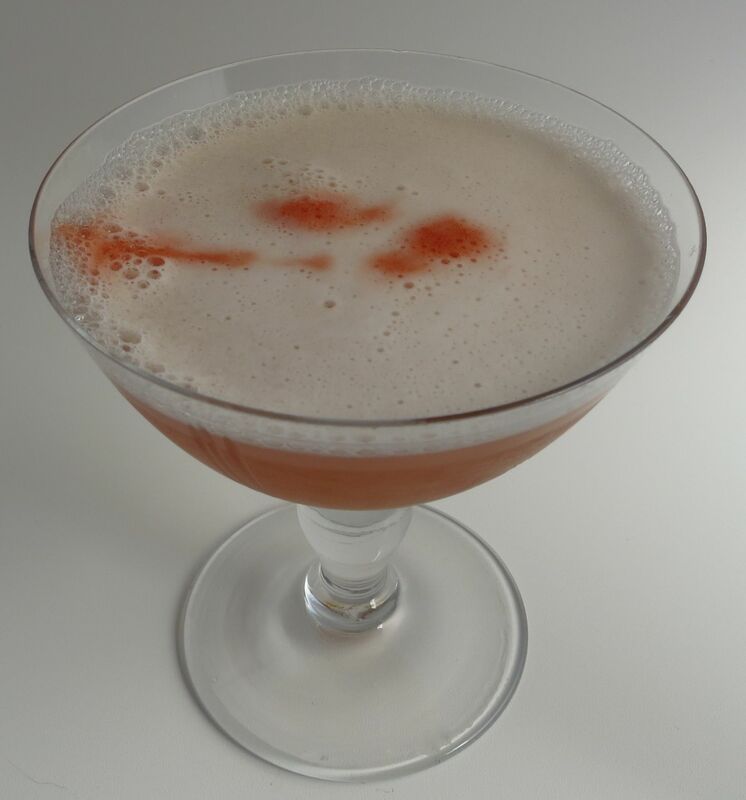 This entry was posted in apple jack, egg white, gin, grenadine, simple syrup and tagged pink lady cocktail recipe, the secret cocktail recipe. Bookmark the permalink. Thank you. I really appreciate it when someone else rules things out! Now I don’t have to try these myself! Keep ’em coming! I don’t know about you, but I do a lot of “pouring down the drain!” That’s how I know I’m pushing at least some limit. I still get to do some drinking! You mignt also try some agar and add some xanthan gum to give body. Agar would be the vegan friendly gelatin. Apparently chickpea water a/k/a aquafaba works well. One chef recommended soy lecithin (needs to be incorporated with a stick blender). I gave up on my vegan Ramos ideas long ago though, but others have continued in that direction. For frothy heads, pineapple and heavy cream and certain bitters like Angostura seem pretty good, but none do the mouthfeel aspect.